The most exciting thing about this deck is the combination of Always Watching and exert creatures. Battlefield Scavenger becomes a pseudo Looter il-Kor to sculpt your draw against control and midrange opponents, while Glory-Bound Initiate and Glorybringer become trumps in creature mirrors that are very difficult to overcome. 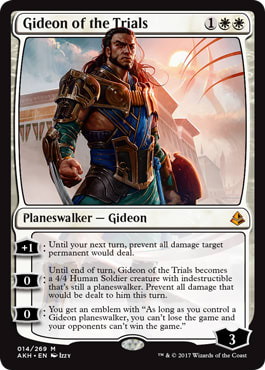 Perhaps the most interesting card in this deck is Gideon of the Trials. Gideon does a lot of things. It’s an efficient threat, and can be a way of stalling out aggressive mirrors. You have to be careful though, as it can be pretty vulnerable to the likes of Heart of Kiran and Felidar Guardian. The most important aspect of Gideon is his ability to be a resilient threat against control decks, demanding an answer like Stasis Snare or Cast Out. The other interesting thing about this deck is the number of ways there are to build it. You could go lower to the ground and play Thalia's Lieutenant. You can start adding some of the powerful vehicles from Kaladesh block. Or you can do what Emma’s done and go bigger to add Needle Spires as a resilient threat and expensive creature trumps like Glorybringer. If you’re looking for a resilient, proactive deck with a lot of flexibility in its gameplan, this seems like a good place to start. You’ve got cards that are well-positioned in various matchups, and the ability to sculpt your build both in deck construction and sideboarding to be lower to the ground or bigger than whatever your opponent is doing.